The contact center could be the epicenter of CX innovation in your business. In the digital age, it’s easy to get seduced by what technology can do. But sometimes it’s the smaller innovations that can make a big impact. What do we mean by innovation? It’s sometimes confused with invention, which implies technology. We like to define innovation as deploying resources and approaches that already exist in one area (technology, processes, insights), to another area in a different context. It’s about looking at an issue with a new perspective to see opportunities to drive improvements by bucking the status quo. Southwest Airlines open seating: The company took the concept used on buses and trains and applied it to an industry with a per-seat purchase model. It sped up the boarding process, kept prices constant (and often lower compared to other airlines), and even changed the types of airline rewards offered. In 2017 it was named a Fortune “Most Admired Company” for the 23rd year, and was the only airline listed in the top 10. Amazon Prime: The concept behind the Amazon Prime subscription service was to provide value to the customer that he or she is willing to pay for, regardless of the product. It began with a two-day shipping option for all Amazon purchases each year, but soon expanded to include exclusive music, movie, and television content. At first glance it didn’t seem like one should be tied in with the other. But by taking a customer focus over a product focus, it made perfect sense. And more than 100 million subscribers worldwide agree. Mayo Clinic’s virtual house calls: The Mayo Clinic Center for Innovation launched a “video visits to the home” program for patient followups, resulting in fewer patient return visits and a deeper, personalized patient experience. The physician is virtually welcomed into the patient’s home in a more relaxed setting, allowing patients to feel more comfortable during the visit. While these are great examples by leading brands, there is also plenty of potential for innovation in any company. 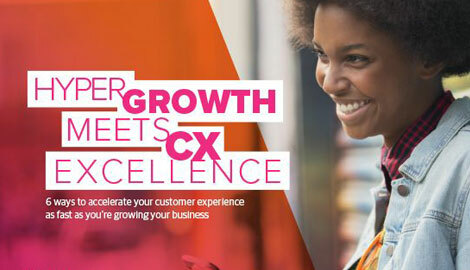 The easiest place to have a big CX impact is to look in the epicenter of your company’s customer experience: the contact center. There are many reasons why the contact center is a good place for innovation. First, it’s the closest to the customer. Associates literally talk to customers every day. They understand the pain points and potential areas of opportunity better than nearly anyone else in the company. You just need to ask them. In addition, associates work on issues together in close proximity, witnessing teammate interactions and sharing their own experiences with one another. They naturally work as an organic, collaborative organization. Members of the group are diverse in thought, experience, and insights, providing new ways of looking at issues. And most contact center organizations are structured to have regular meetings, huddles, and team activities to collaborate, learn, and grow. It’s an environment where innovation can thrive. The contact center is also very efficiency-focused, so team members and leaders are always looking to think creatively to solve a problem or find a solution in a different way. Move from voice to digital: A major energy company was hemorrhaging customer goodwill by sending out payment reminder statements to customers who had already paid their bills, chasing debts that didn’t exist. Though the problem had been known for some time by the company, it was a TTEC brainstorming session that identified root causes and deficiencies in the systems and processes that resulted in pain for customers. Together, the client and the TTEC team changed systems to prevent the generation of spurious reminders, simplified the steps in a process, and replaced sternly printed letters with a “soft” SMS message reminding customers about payments. Results were significant and immediate, with 60 percent fewer incoming calls and improved customer satisfaction metrics. In addition, the company saved more than $100,000 from reduced fines, eliminated printing and mailing costs, and fewer customer credits. Prevent churn through analytics: The CEO of a consumer products company received numerous direct complaint phone calls because some customers’ email requests were not answered after multiple messages. The TTEC team looked at how to prevent future escalated calls to the CEO. The team discovered that most CEO calls took place after three unanswered emails, and set up an automated workflow to move people with three emails to the top of the queue. Associates focused on immediately reaching out and apologizing to customers who had emailed three times, predicting and prioritizing the most at-risk customers while streamlining operations. The queue went from as high as 30 customers per day to single digits. The move cost no money, yet prevented customer churn, positively impacting overall company revenue. The data analysis showed that three was the magic number—two emails were often just a customer sending an attachment related to the first email, and four or more emails meant that those customers were often too far gone to be saved. After implementing the prioritized queue, executive complaints dropped. What’s more, the analysis was used with other clients to help predict and prevent churn elsewhere. Empower employees with digitized training: Instead of having to wait to start employee training on a Monday or when a class was full, TTEC’s Learning and Performance practice teamed up with partners mLevel and Allego to digitize training certification programs for trainers, coaches, and team leads. The program allowed for employees to learn via video tutorials and AI virtually at any time, without the need for face-to-face classroom interactions. Employees completed the exercises within a timeframe window and recorded themselves, then received feedback from trainers within 24 hours. Facilitators who used to manage a classroom of up to 10 students could now work with as many as 50 students without any extra resource strain. The program also reduces training time by 50 percent, which saved money and improved productivity. Let teammates help each other: One of the world’s largest tech firms worked with TTEC to manage sales leads for its European customers in 13 different languages. The associates often worked on their own, rarely collaborating with other team members. Service levels and productivity suffered as a result. The organization shifted to a pod structure that combined high- and low-performing associates into collaborative groups. The groups competed to improve KPIs as teams, rather than individuals. Allowing peers to help one another was a great influencer on performance. Because the associates didn’t want to let their team down, they all worked together to share best practices, learn from one another, and grow as a group. After switching to a pod structure, service levels increased by 18 percent, and productivity grew 21 percent. These examples reflect that innovation is found not only through technology, but also through people and process as well. Examples like these are made possible when employees and leaders alike are encouraged to share new ideas. Operational status quo isn’t considered good enough, and strict hierarchies are loosened, so everyone feels like they have a voice. The mindset of the organization should be one of innovation and experimentation. In speaking with a colleague who oversees client contact centers, he stressed the importance of having leaders sit side by side often with associates to gain perspective on the experience. Associates face challenges in process, knowledge base issues, or workflow, and many just deal with them or figure out how to get around them. By sitting with associates and seeing how they work every day and the types of interactions they manage, contact center leaders can help identify potential innovations or changes. In addition, encourage employees to suggest new ideas. Employee morale, satisfaction, and retention is positively impacted if associates feel that they are involved in changing things for the better. 1. Don’t be satisfied with the status quo. Change the mindset to be one that is open to changes. 2. Be transparent about the need and socialize issues to activate your community of experts. 3. Empower associates to speak up and offer suggestions. Encourage new ideas. Formalize idea and brainstorming sessions. 4. Provide awards/incentives when employees speak up and offer suggestions. 5. Take a triage approach. Can we fix it? What can we do? Who can do it? 6. Get people from outside the organization to weigh in, to add a diverse set of perspectives. 7. Try things, and don’t be afraid to fail. 8. Apply something that works well somewhere else and see what happens. Every company is different, so new ideas will be the product of the culture. The key is to center innovations around the customer experience rather than a new technology or flashy gadget. Even small changes can have a big impact when they positively affect the customer experience.